Chloe isn't like the typical girls in high school. most girls in high school. She's not tall and skinny she's short and considered overweight. She's not what most guys go for. 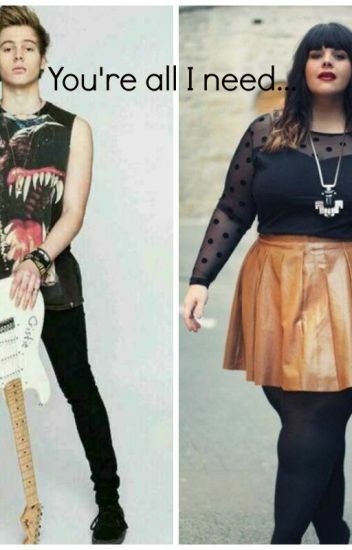 So what happens when she meets Luke? NOT AN UPDATE I AM SOOO SORRY /VOTE VOTE VOTE!! "You want to come to Ashton's house with me? You can meet the rest of the band too." Who knew that question would change my life. Nope. Totally cliche, but nope. Kristin isn't the slimmest girl you'll possibly meet. But that doesn't mean she's the fattest either. She's partially obese, that's what she thinks, and, as typical as it sounds, she's always bullied by the jocks and cheerleaders. They're own view of perfection isn't like hers; not so boney, gorgeous, tall, nice. But that's not really the point. Senior year of high school for everyone is ending soon, just one more month. One more month before everything is officially over and everyone is free to go. But one month means huge projects, which also means... things changes. And if you're paired up with someone you totally despise, oh, this bound to be good. The story of a fat girl who was sent away in a student exchange program to Japan. In her long journey on unknown land, she learned the cruel reality and beauty of the real world. She left her country fat and slimmed down with a strict diet program. After the exchange program ended, she returned back to her home country in search of true love but in her old fat size?? Since everyone write unrealistic plus size love stories. I'm going to give you guys one you can actually believe. Giannah and Giovanni are twins but Giannah is a big girl, her dad is black and her mom Italian and Irish. Giovanni isn't as big as his twin he is star of the football team. No one teases Giannah unless it's behind Gio's back. Giannah is shy and usually stays to herself, she barely talked to her own twin at school let alone friends. She has one good friend Destiny, until one of Gio's friends Isaiah takes a sudden notice in her. READ CHAPTER 1 TO FIND OUT MORE! A coming of Age story about a girl who finds out who she is beyond what she was. "The fat girl"
Join Isabella as she deals with love, loss and realizations that she is stronger than she ever could have imagined. That morning walk changed my life. I bet you're all expecting a dramatic move to Australia and I meet the boy that turns out to be the love of my life, well i guess you're right. But i didn't know that at the beginning, and hearing the news that i was leaving all my friends and family behind in England was distressing. But it turned out to be the best move of my life. Little did I know that I may have ruined my first and only love when a certain someone spills their feelings. This life wasn't supposed to happen to a 16 year old, from a little town in England. A girl who's never felt at home & a boy who becomes her home. Liana felt like life was worthless,and like she was a waste of space. So she planned to to end her life. She failed and her very neglecting family  found her sleeping but they thought she was dead. Due to all the pills scattered on her bed and the little note that said "sorry, this is for you guys." They had no choice but to call the ambulance. After a week later liana was obligated to go to a support group. There she found Dylan.